 Public Lab: Toward calibrating H2S sensors. Up front, I want to make clear that we have not gotten down the road very far on this project, mostly because I haven't gone out and recruited anyone who is particularly interested in working with toxic gasses that smell really bad. I have, however, given some thought to how you would do this without either killing yourself or making yourself severely unpopular with your colleagues, and I have started to put together the stuff necessary to do this. This note is intended to allow someone who has the necessary background, access to a lab, and the interest to follow up. While the protocol should allow one to safely work in a way that keeps the stuff confined, I strongly recommend running this type of experiment in a well functioning fume hood. You been warned. 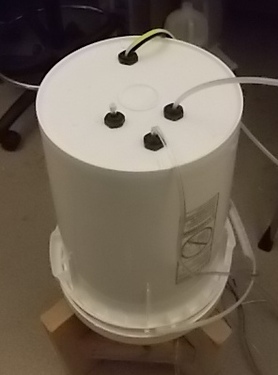 What I want to do is to put together a reliable protocol for testing and comparing different methods for measuring airborne hydrogen sulfide at concentrations that are relevant to air quality monitoring (well below 100 ppb). There are at least three methods for measuring hydrogen sulfide described on the PL web site; the test strip method, the electronic sensor method, and our indirect voltammetric method. Recently, kensanfran published a Note that discusses gas sensors from a company that sells a hydrogen sulfide sensor. 34.09 (g H2S / mol) / 22.4 (L of gas / mol) = 1.5 g H2S / L of gas density of N2 gas at STP: 28.02 (g N2 / mol) / 22.4 (L/mol) = 1.25 g N2 / L. concentration of H2S in 1% by volume converted to ppm: 1.5 (g H2S / L H2S) * 1% = 0.015 (g H2S / L gas mixture) 0.015 (g H2S / L gas mixture) / 1.25 (g N2/L) = 0.012 (g H2S / g gas mixture) = 12,000 ppm dilution of 10 mL gas mixture to 5 gal: 5 gal * 3800 mL / gal = 19000 mL 12,000 ppm H2S * 60 mL syringe / 19000 mL bucket = 38 ppm OK, so the biggest syringe I have times the highest concentration available gets you to about four times the OSHA standard for worker exposure. That seems like an ok range to be in. Ok, so here is the part where I have never gotten to (yet). The issue is to get a known volume of gas at a known concentration. 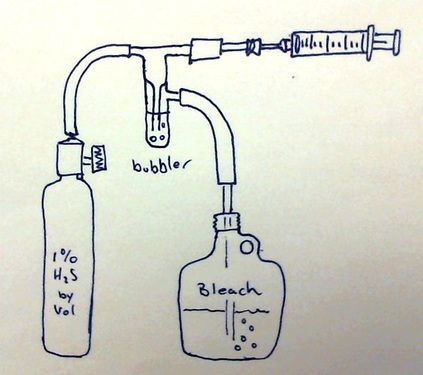 To do this, set up the apparatus in the drawing below. The use of the mineral oil bubbler keeps the pressure of the gas sample at very close to the atmospheric pressure and the system is contained. 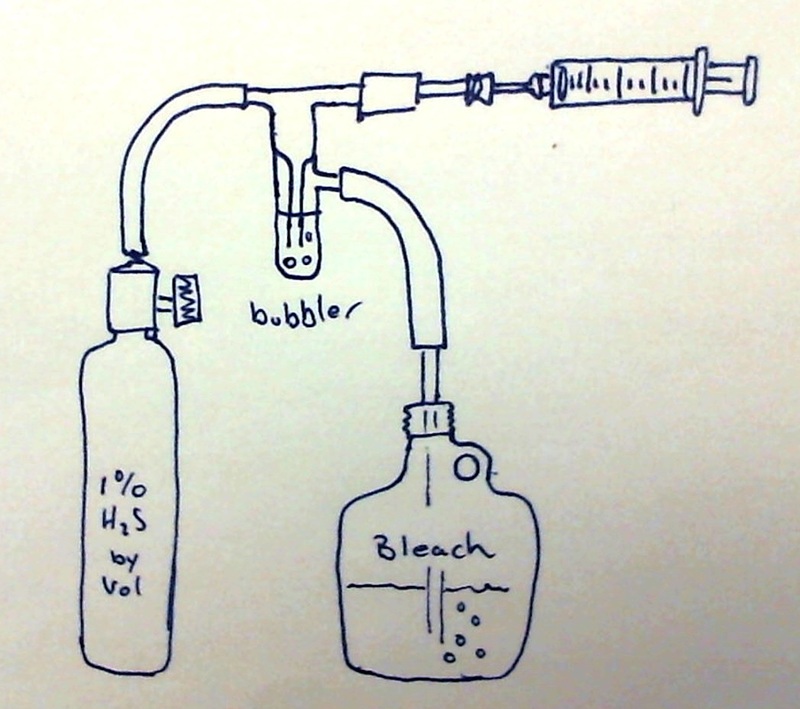 As the gas exits the cylinder, it bubbles through the bubbler and then is passed into a bleach solution which should kill off the unused H2S. The gas is sampled through a rubber serum septum using a syringe before it exits the bubbler. Use a syinge with a luer lock so that there is no chance of the needle slipping off the syringe while removing the syringe from the apparatus. Start with the plunger depressed and withdraw the plunger to introduce gas into the syringe. Withdraw the plunger slow enough that you never get gas from the exterior flowing into the system through the bubbler. Once you have the correct amount of gas in the syringe, remove it from the apparatus by pulling the needle back through the rubber septum and inject the gas into the septum that allows access to the 5 gallon bucket and inject the gas into the bucket. Do not try this unless you understand all the steps. Very cool! I want to be sure @sophie, @ewilder, @Clarke_Brian, @deepwinter, @megan, and @fernandolunav see this and you all can coordinate on different h2s approaches and calibration. I know Sophie was doing a test series in a hood, for example.